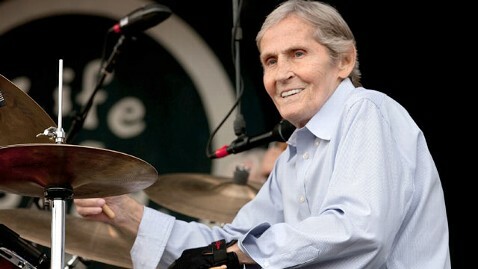 Recent reports that have been circulating about the deteriorating health of founding Band singer/drummer Levon Helm unfortunately appear to be true. A message from Helm's wife, Sandy, and daughter Amy has been posted on the revered musician's official website revealing that he "is in the final stages of his battle with cancer." The note goes on to ask fans to "send your prayers and love to him as he makes his way through this part of his journey." Sandy and Amy add, "Thank you fans and music lovers who have made his life so filled with joy and celebration… he has loved nothing more than to play, to fill the room up with music, lay down the back beat, and make the people dance! He did it every time he took the stage." During the 1990s, Helm was treated for throat cancer, but he recovered from the disease and went on to record a number of acclaimed solo albums, including 2007's Dirt Farmer and 2009's Electric Dirt, both of which won Grammy Awards. Helm also hosted a regular series of jam sessions called "The Midnight Ramble" at his home in Woodstock, New York, but he had canceled several recently scheduled performances. He also nixed an announced appearance at New Orleans Jazz and Heritage Festival later this month. Levon, of course, was the most recognizable vocalist in the influential Americana group The Band, singing lead on such enduring tunes as "The Weight," "The Night They Drove Ol' Dixie Down" and "Up on Cripple Creek."